A Prezzee RedBalloon digital Gift Card is the leading gift provider for experiences in Australia and New Zealand providing gifting inspiration for every occasion. Great for him, her or perfect for that couple who might ordinarily be a little tricky to buy for. With a RedBalloon Prezzee eGift Card, you are giving the gift of an unforgettable experience that your giftee will be able to select at a time and date that suits them. The Gift Voucher revolutionised gift giving, giving the gift of choice with every present and ensuring that your giftee was never stuck with something they didn’t like. Now, Prezzee has improved on the perfect gift by introducing delivery directly to your recipient via SMS or email and impossible to lose. A RedBalloon gift opens the doorway to redeeming a range of things from relaxing getaways to adrenaline-fueled activities including Driving; Flying; Gourmet; Getaways; Adventure Sports; Outdoor Activities; Indulge; Water Sports; Creative Gifts; and Team Building, as well as a range of gifts and hampers, there truly is something for everyone. Imagine the thrill of tandem skydiving from 14,000ft; the indulgence of a progressive dining experience at 3 beautiful Sydney harbour-side restaurants; the beauty of a scenic helicopter flight over iconic Australian landmarks; the feeling of racing over the water at up to 100km an hour on an extreme whale watching cruise; the exhilaration of a V8 race at famous racetracks, or a rally drive in the bush; or the relaxation that can only come from a 90 minute massage in your own home. 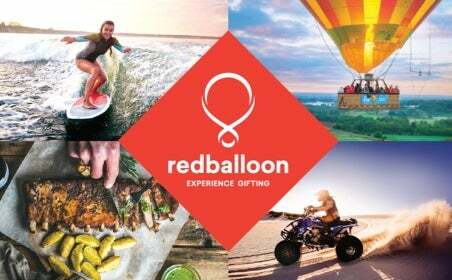 Whether you’re looking to help that special someone check-off a bucket list experience, indulge in something more luxurious than they’d be comfortable treating themselves to, or just gift some good old fun in the form of an experience, we’re sure that those important people in your life will be thrilled to receive a RedBalloon Prezzee Gift Card. A Prezzee RedBalloon Gift Cards also make for a fantastic corporate gift. What better way to thank both clients and customers alike than with the gift of a memory created through doing a RedBalloon experience. Gift Vouchers and Gift Cards are for a monetary value and are used to purchase experience vouchers or gift products via online.